TOKYO (AP) — Japan's space agency says more than 200 photos taken by two small rovers on an asteroid show no signs of a smooth area for the planned touchdown of a spacecraft early next year. NEW DELHI (AP) — India signed a $5 billion deal to buy five Russian S-400 air defense systems on Friday despite a looming threat of U.S. sanctions on countries that trade with Russia's defense and intelligence sectors. TOKYO (AP) — New photos taken on the surface of an asteroid show that it is (drum roll, please) ... rocky. LOS ANGELES (AP) — Los Angeles harbor commissioners have approved a permit for Space Exploration Technologies to build a facility on 19 acres of port land to manufacture a Mars rocket that will be so big it will require an oceangoing barge for transport to launch sites. Space Exploration Technologies Corp. launched a rocket carrying 5,800 pounds of supplies Monday afternoon as part of its longstanding contract with NASA to ferry cargo to the International Space Station. The Falcon 9 rocket lifted off from Cape Canaveral Air Force Station in Florida. The mission’s Dragon spacecraft is packed with nearly three tons of research, crew supplies and hardware, according to NASA. 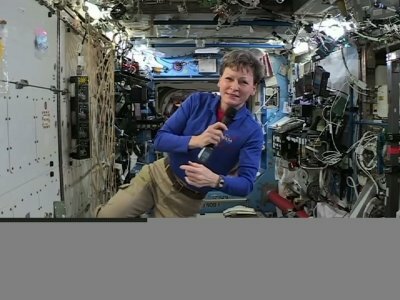 MOSCOW (AP) — A Soyuz capsule carrying two Americans and a Russian cosmonaut has docked with the International Space Station. MOSCOW (AP) — Two American astronauts and a Russian cosmonaut are on their way to the International Space Station. A Soyuz rocket carrying the three men blasted off Wednesday from the Russia-leased Baikonur launch pad in Kazakhstan. On board the capsule were NASA astronauts Drew Feustel and Ricky Arnold, and Roscosmos' cosmonaut Oleg Artemyev. If Apollo 13 astronaut Fred Haise were given a chance in the 1970s to make the nine-month trek to Mars, he most certainly would have declined. In fact, he finds the idea of such a long mission boring, even though he realizes the mission is vital. WASHINGTON (AP) — President Donald Trump says it's good that "rich guys" love rocket ships. Trump says their willingness to pay for some space exploration is "better than us paying for it," meaning the federal government. The president spoke Thursday as he opened a Cabinet meeting at the White House. 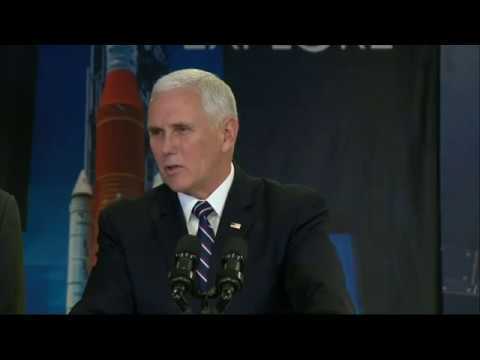 Vice President Mike Pence was scheduled to provide an update on space issues in his role as chairman of the National Space Council. This year marks 60 years since the United States started sending satellites into space, including one on March 5, 1958, when the U.S. attempted to launch its second satellite into space. During that span, we have led extraordinary scientific discovery across our solar system. But our space exploration has taken a toll on one particular thing: the orbital environment. Madison scientists and engineers will be working on bigger and better ways for astronauts to eat fresh food in space, thanks to a contract awarded by NASA. Sierra Nevada Corp. has signed an agreement with the space agency that will give the company’s Madison operation — formerly known as Orbitec — another two years to work on plant growth modules, some as big as a room. SALT LAKE CITY (AP) — A Salt Lake City school named after President Andrew Jackson is being changed to honor a pioneering woman in U.S. space exploration. The Salt Lake City School District Board of Education voted unanimously Tuesday night in support of the change from Jackson Elementary to Mary W. Jackson Elementary School. It's the first school in Utah's capital city to be named after a woman. WASHINGTON, D. C. - When American astronauts visit the moon and Mars on the upcoming manned missions that President Donald Trump ordered last week, there's a good chance their space exploration vehicles will use tires made of special springs that are under development at Cleveland's NASA Glenn Research Center. Elon Musk's rocket company is about take another step toward making spaceflight cheaper. Space Exploration Technologies on Wednesday will double down on the concept of recycling spacecraft that the company has flown and landed back on Earth. In a mission for NASA, SpaceX will reuse both a rocket and a capsule that it's fired off before. TEMPE, Ariz. (AP) — Arizona State University is joining an international consortium building a large new optical telescope in Chile. Director Lindy Elkins-Tanton of Arizona State's School of Earth and Space Exploration says participation in the Giant Magellan Telescope Organization is a leap forward institutionally for the university. LEOMINSTER -- It's Tara Sweeney's job to help people experience micro-gravity by flying them to an altitude of 20,000 feet before dipping the plane downward, giving passengers a feeling similar to the weightlessness they'd feel in outer space. It's a fun job, and one Sweeney hopes that area students will one day have a shot at as well. HUNTSVILLE, Ala. (AP) — Acting NASA administrator Robert Lightfoot is among the speakers scheduled to appear this week in Huntsville at a meeting on space exploration. The 10th annual Wernher von Braun Memorial Symposium is set to begin Wednesday. The two-day event named for the late German rocket engineer and NASA pioneer will be held at the University of Alabama in Huntsville. Lightfoot is scheduled to speak at the meeting, which will focus on advancing opportunities in space. Among the beakers and petri dishes at the Southside High School lab room Monday morning was an ordinary-looking UPS box. But three ninth graders in white lab coats, two scientists, and U.S. Rep. Will Hurd gathered around it with fixed gazes. “I’m afraid something is going to jump out,” joked Hurd as Neco Jimenez, 14, started ripping open the box. Gabriella Woods of Roseburg recently attended Space Camp at the U. S. Space and Rocket Center, NASA Marshall Space Flight Center’s Official Visitor Center. The week-long educational program promotes science, technology, engineering and math (STEM), while training students and adults with hands-on activities and missions based on teamwork, leadership and problem solving. HARRISBURG, Pa. (AP) — Pennsylvania's top prosecutor wants to make sure people don't get burned by glassed they've bought to view Monday's solar eclipse. Attorney General Josh Shapiro says folks should check to make sure their glasses have filters recommended by NASA, the National Aeronautics and Space Administration, which runs the nation's space exploration program. ABERDEEN - Last month Aberdeen High School mathematics teacher, Diana Sargent, served as a teacher-mentor for the Idaho Science and Aerospace Scholars (ISAS) Summer Academy. FARGO, N.D. (AP) — Students at North Dakota State University in Fargo are working with NASA scientists to develop a better technique for 3D printing in space exploration. The 11 students working with a NASA field center in California called Jet Propulsion Laboratory range from freshmen to graduate students, the Wahpeton Daily News reported. They're pursuing majors in mechanical engineering, computer science and electrical engineering. WASHINGTON (AP) — The type of vehicle that could explore the surface of Mars is going on display in Washington. ATLANTA (AP) — A Mars Rover concept vehicle is launching a tour of the East Coast with its first stop at the Atlanta Braves' new stadium near Smyrna, Georgia. The 5,500 pound, 11-foot-tall space vehicle will be on display outside SunTrust Park from 4 to 6 p.m. Friday and Saturday; and from 10 a.m. to 2 p.m. on Sunday, as part of the "Summer of Mars Experience Tour." WASHINGTON (AP) — President Donald Trump is forming a National Space Council to be led by Vice President Mike Pence. The president signed an executive order Friday to revive a council last in place in 1993. Trump says the announcement sends a clear signal to the world about the United States' leadership in space. He says space exploration would help the economy and national security. LOWELL, Mass. (AP) — Astronauts, scientists and entrepreneurs are celebrating the 60th anniversary of the start of the Space Age and looking ahead to the next frontiers at a conference in Lowell. "Space Exploration in the Upcoming Decade: The Domestication of Space," will bring industry leaders from around the world to share their work. The conference will be held at the University of Massachusetts-Lowell from April 21 and April 22. Sunnyslope Elementary School students had the time of their life at the school’s science exploratorium Thursday evening. Kids got a chance to explore space, embarking on a journey to discovering how the planets align, the effects of gravitational pull and what makes up the solar system. Fourteen booths were lined up in the school’s cafeteria with a variety of hands-on activities for families to enjoy. U.S. Rep. Brian Babin (TX-36), who is Chairman of the House Space Subcommittee, today joined a group of his colleagues at the White House to watch President Donald Trump sign the National Aeronautics and Space Administration Transition Authorization Act of 2017 into law. This bipartisan, bicameral legislation reaffirms Congress' commitment to the National Aeronautics and Space Administration (NASA) and directs NASA to pursue a balanced portfolio of activities. It also includes the TREAT Astronauts Act, which was authored by Rep. Babin to give NASA the ability to care for our astronauts and enhance our understanding of the effects of spaceflight on the human body. The image flashed on the screen, a huge shadowed crater on the surface of the moon, and Charlie Duke put a hand to his jaw. He'd walked there. The next one showed a family photo lying in the moon dust, and he smiled. It was of his family.